The Denver Broncos have waived veteran running backs Stevan Ridley and Juwan Thompson after the emergence of rookie RB De’Angelo Henderson in a stacked backfield. Thompson forced eight missed tackles on just 14 carries this preseason, averaging 4.64 yards after contact per carry, while Ridley was less impressive, forcing just one missed tackle on 38 carries. 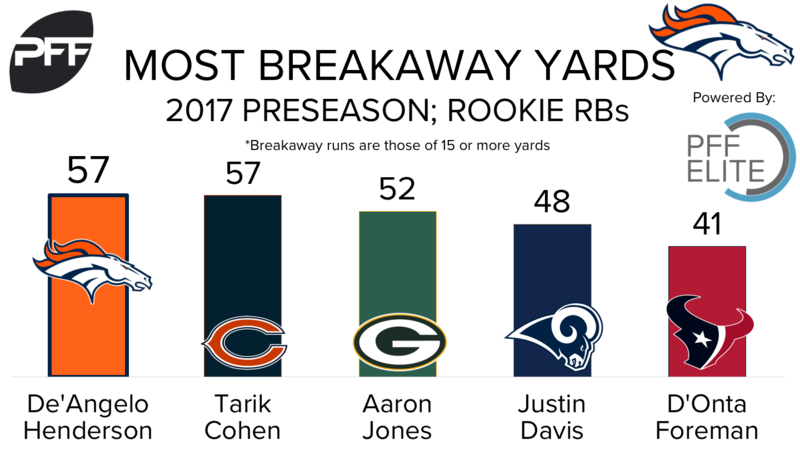 Henderson, on the other hand, finished his inaugural preseason with seven total missed tackles, including six on run plays, which tied him for fourth-most among rookie running backs in 2017. Where he shined brightest however, was his brief breakaway ability. He logged two runs of over 15 yards, totaling 57 yards on those two, which was tops among rookies.